Key Horse: 4-TRIPLE ASSET is a possible lone speed in here and is a healthy 8/1 on the American simulcasting Morning Line. Gets ace Aussie jockey Micheal Rodd, who won well with him in a race a notch below today's race. The winning margin last out was 3 and 1/4 lengths, which is equivalent to a 5 or 6 length win in an American dirt race. Two races back "TA" lost by a neck to a 3-time winner named Golden Archer, who was a very impressive winner over better last weekend going "down the Flemington straight." All Systems Go for this Triple Asset today. Exotic Horses: 3-Metonymy is the only other logical speed horse entered in the race, but super-trainer Peter Moody has also entered a very well bred first time starter, 12-Plucky Belle (with usual Moody go-to rider Luke Nolen named to ride). I'm going to use both Moody horses. Bet(s): $80 WIN on 4. $3 EXACTA 4 with 3,12. $1 TRIFECTA 4 with 3,12 with 3,12. COMMENTS: Rudy Rodriguez, Cornelio, last time he was beaten at 3-5, today the group is softer, good post position and a relatively superior pace and final figures. BET(S): $100 WIN on 4. COMMENTS: Dixie City has a steady pattern of workouts with the last two almost identical, one of them a bullet. She posses the best PF of the race. Joyful Victory, now under Jones training regime, has been training at Oaklawn throughout the winter after capping her 2-year-old season with a fifth-place finish in the BC Juv Fillies (G1). She will enter her first race of the year off a bullet workout posted Monday morning when she covered five furlongs in 58 4/5. She has the second best PF here, against better company (a very important note). As matter of respecting history and trayectory, Joyful Victory will bid to give the Jones Family their fourth straight Honeybee victory! BET(S): $20 WIN on 5. $20 EXACTA BOX 3,5 with 2,3,5. COMMENTS: Stephengothisstar has the best BRIS Avg. Dist/Surf Pace-Speed Figures of the race and his ML is 10/1, which means value! In his last, he was eased and walked off over a sloppy, messy surface. I assume that whatever happened that day was not serious. He returns 21 days later here. 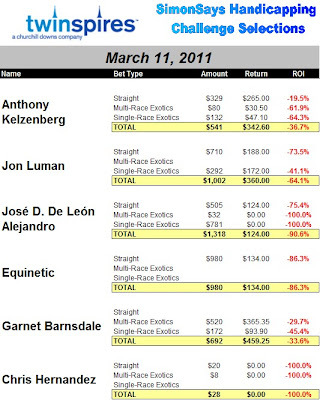 Zimmerman is still on top and his combo with the trainer is very hot recently and all the meeting. This fact gives me confidence. Wiredfortwotwenty is onfire right now, undefeated in SUN and looking for his 4th straight win. River Echo has been another horse since trained by Henry Dominguez. This horse is well rested and trained for this race. He has the figures to pull off an upset as well. BETS: $10 WIN/PLACE on 4 & 6 and $0.10 SUPERFECTA BOX 1,4,5,6,7. COMMENTS: Royal Delta is the real deal, but she is coming back from a long layoff and Bill Mott has been discreet with this kind of angle recently. So, I will risk with 8-1 ML Devilish Lady, undefeated in Tampa, tactical speed, affinity with her jockey Centeno. Four out of five of her last starts has been very easy wins and his last was just a too fast pacing against very good company. BETS: $10 WIN/PLACE on 10. COMMENTS: Brethren won the Sam F. Davis in rather easy fashion one month ago, repeating the same Beyer he did in his only 2 previous races. His PF was -21. Comparing his PF with the last 2 winners of the Sam F. Davis, Rule (-45) and General Quarters (-51), makes his figure looks low. And if we track the PFs of the last 9 winners of the TAM Bay Derby, we see the lowest in Musket Man (-30) and the highest in Equality (-64). A PF equaling -21 means that this group is weak and either Brethren wins again with a relatively average performance or we can see another colt stepping up and beats him (like Musket Man did to General Quarters last year). That horse could be Free Entry, coming to his 3rd off layoff (an angle Chad Brown dominates 21%). He certainly has more improving to do off those last 2 effort and speed figures and he is bred to handle this two-turn trip very well. He has the best Beyer of the race (86) and the best best last race Equibase Speed Figure in the field (101). Chad Brown is also good shipping, running horses in graded stakes and repeating victories. A very productive J/T combo is a plus. BETS: $20 WIN on 7 and $1 TRIFECTA BOX 5,7,8,10. Rule The Storm has also stamina on her side and a great rider. Bella Roja and Lisa Lulu are the class of the field, very experienced gals in the downhill turf. BETS: $20 WIN on 1 and $2 EXACTA BOX 1,4,7. 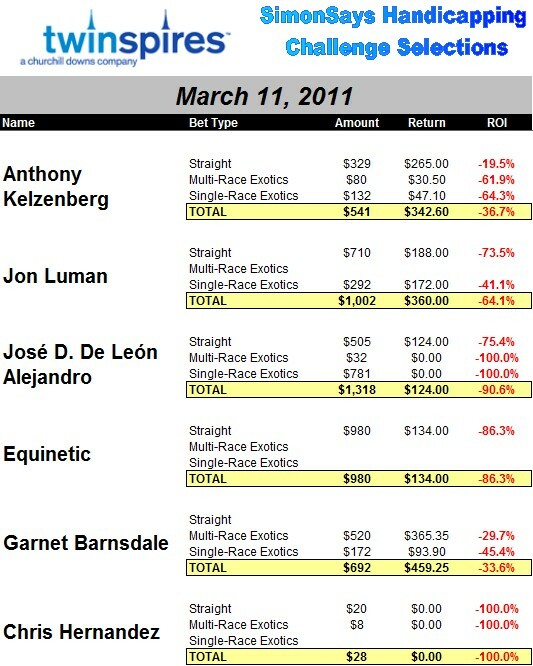 Editor’s Note: For more information on PFs (Performance Figures), visit http://www.chef-de-race.com/. Comments: I am interested in Jaycito as very intriguing and talented Derby prospect. When he behave properly, he has the tactical speed, stamina and pedigree to be a key player in that race. I think Baffert will have him primed at the right time, but in this spot, I’m taking a wait-and-see approach. Then, Premier Pegasus and Comma to the Top are the main guys here by figures, fitness and experience. Both colts should get the best trips of all. They can stalk and bounce, or even go wire-to-wire if necessary. However, I will take a chance with Surrey Star. His first dirt race was surprisingly good and he has a very strong foundation. He is working very well and this is his 3rd start in the US, 2nd start off layoff. In his last race (dirt debut), he was posted in the rail, broke a tad slow and then make a huge move between the 1st and 2nd pole, a 21 second-quarter, just to finish beaten 4-3/4 lengths with The Factor and 1-1/2 behind Premier Pegasus. I think 2-turns is his game and stamina should not be a problem. He has a great chance of pull off a huge upset here. BETS: $20 WIN, $35 PLACE and $50 SHOW on 3. Bet(s): $1 PICK FOUR 2,3,4,5,6,7,8 with 2,4,7,10 with 1 with 8. Comments: 8-Phenomenal Grace showed some guts to win on the off track last week (as predicted). I'm sticking with her at what is sure to be a better price. Bet(s): $40 WIN/PLACE on 8. Comments: 5-Spirit To Spare ships in off two very impressive wins first-over at the Big M; looks like a key here. Bet(s): $100 WIN on 5 at odds of 6/5 or higher. Comments: 5-She Just Rocks was victimized by a slow middle pace in last, came home with a 26.4 kicker. Expecting more agressive drive tonight. Bet(s): $100 Win on 5. Bet(s): $1 PICK FOUR 1,2,4,5 with 1,8 with 1,2,3,6,9 with 2. Bet(s): $25 EXACTA BOX 1 & 8. Comments: 2-Let's Went Robbie is already in decent form, now gets one of the more potent angles at this track: first-time Serge ("The Magician) Masse in the bike. Bet(s): $200 WIN on 2 at odds of 1-1 (even) or higher. Comments: Gonna take the superstar Black Caviar on top in a tri and super to get the 2nd choice beat for 2nd. Bet(s): $6 TRIFECTA 1 with 3,6,7,12 with 2,3,6,7,12 and $1 SUPERFECTA 1 with 3,6,7,12 with 2,3,6,7,12 with 2,3,6,7,12. Comments: 3-Quater Byama has been on my watch list for a couple of weeks and need only move earlier to get it done here. Bet(s): $30 DAILY DOUBLE 3 with 1,4 and $40 win on 3 at odds of 2-1 or higher. Comments: 9-Cat Four had blazing early speed not that long ago. One of these times he is gonna gun to the top and not stop. Comments: 8-Last Call Hanover blasted to the top and almost held after cutting a 55.0 half in last. Was a very good quick leaver when last on a roll. Could wire these. Bet(s): $50 WIN/PLACE on 8 and $2 EXACTA KEY BOX 8 with ALL.